Flower Ornament Depository 華嚴藏: Who wrote the Mahāvairocana-sūtra? 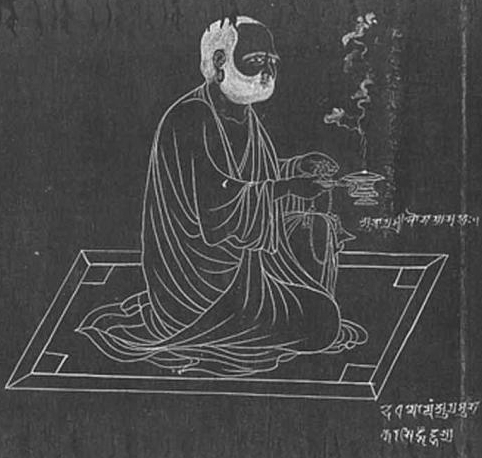 Śubhakarasiṃha 善無畏 (637–735) is noteworthy as one of the early tantric adepts to visit China and introduce a number of texts and practices in addition to providing initiations (abhiṣeka). He was a contemporary of Vajrabodhi 金剛智 (671–741) and the young Amoghavajra 不空 (705–774). He is most known for his translation of the Mahāvairocana-sūtra 大日經 (T 848), which was done with the assistance of the Chinese astronomer monk Yixing 一行 (683–727), though he was also active at court and was responsible for other texts. He was born into the royal family of Orissa, but he renounced the throne when his brothers initiated a violent struggle over the succession. In light of his royal background and training at Nālandā, he was likely the most educated Indian monk to live in China in the eighth century (he arrived in 716). He was instrumental in the transmission of early Tantra into China. He might also have been disciple to the human author of the Mahāvairocana-sūtra. There is an interesting document from 834 detailing the history of the maṇḍala lineages which quotes Śubhakarasiṃha as follows. This indicates that the early tantric literature was put down in writing in major centers of Buddhist learning such as Nālandā in Magadha. In the case of the Mahāvairocana-sūtra, Dharmagupta is said to have received it from Vajrapāṇi, which seems to mean he was responsible for penning it. The history of the lineage in India before its introduction to China, and thereafter to Japan first via Kūkai 空海 (774–835), was surprisingly short. The lineage was also transmitted to Tibet and is still maintained, though not necessarily practiced, at least in the Sakya school. I am unsure if there are any details available on Dharmagupta. We might imagine he flourished in the mid-seventh century at Nālandā. He might have been a contemporary resident of Nālandā when Xuanzang 玄奘 (602–664) stayed (he arrived in India in 633 and returned to China in 645). As far as I know Xuanzang never mentions the existence of such a lineage even though he was a master of dhāraṇī. One gets the sense that ‘Tantra’ as we would recognize it with abhiṣeka and maṇḍala emerged relatively quickly, though many of its elements existed beforehand in various forms. 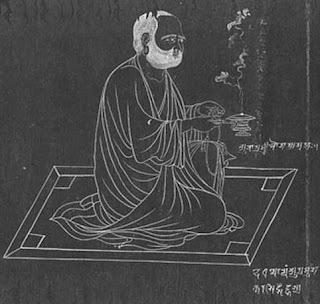 Dharmagupta might have been one of the early innovators and initiators of Buddhist Tantra. It is furthermore quite instructive that he was from Nālandā as it narrows down the general location we ought to search for in seeking the origins of Buddhist Tantra. It also raises questions concerning the social and political climate which existed at the time in Magadha to foster such developments. It seems it was a time of ongoing conflicts, especially after the collapse of the Harṣa-vardhana dynasty in the mid-seventh century. This brings to mind the point that one can learn a lot about ancient India through reading Chinese sources. Indology without Classical Chinese is subject to a severe handicap. For example, in my research I’ve uncovered a number of things about Indian calendars and astrology that are never mentioned in Indological resources such as modern monographs and encyclopedias that treat such subjects. Although the scholars involved certainly all know Sanskrit quite well, the reality is that a great amount of Indian literature is preserved in Chinese, to say nothing of all the accounts of India as written by East Asian monks such as Faxian, Xuanzang, Yijing and Hyechao. The latter have all been translated into English, but there are still other accounts of India that are preserved in secular Chinese histories which have brief accounts of foreign countries. Just as an example, I compiled all the accounts I could find of Nepal in Chinese sources and translated them (see here). If you dig around Chinese sources – secular and Buddhist – which are increasingly digitized, there is much data one could collect about ancient India and even Persia (see here). What this really points to is the artificial barriers between fields like Indology and Sinology. They really ought not to be treated so separately as they complement one another. I suppose this is the advantage that Japanese Indologists have had over Western Indologists – they generally read Classical Chinese and can refer to those sources. This was especially the case in past generations when Japanese scholars attained basic literacy in Classical Chinese before entering university, much the same as Latin was expected of European students. This is not so much the case any longer unfortunately. I think Ryuichi Abe makes an important argument in The Weaving of Mantra about Esoteric/Exoteric traditions. He says that Tantra is a context within which practices and texts take on certain meanings. As you say some elements that were incorporated into the Tantric synthesis, like dhāraṇī, had already been around for centuries. But without the proper context, Abe emphasises the abhiṣekha ritual as being central to this context, the elements are not themselves Tantric or even proto-Tantric. There is quite a bit of information in the introduction of Hodge's translation of the text from Tibetan: Mahā-Vairocana-Abhisambodhi Tantra. (Routledge). I find this the most useful translation, though Routledge did screw up the printing in some places. Anyway he dates the composition to ca. 640 CE. Stephen Hodge is a nice guy too. I assume you know these sources, but include them just in case. Whether we take these references to Nalanda literally is another question. Why is it always Nalanda and not one of the other major monasteries that must have dotted India even at this period in time? Anyway, yes I wholeheartedly agree on the value of Chinese sources and wish I had discovered this much earlier so that I wasn't dabbling in the language in my 40s, but had done a proper job learning it 20 years earlier. Hodge’s translation is a fine work. His introduction is also quite useful too. Unfortunately, nobody has translated the commentary to the Chinese translation by Śubhakarasiṃha and Yixing. It is quite significant in light of the fact that Śubhakarasiṃha was probably the direct disciple of the author of the text. However, some have contested the authorship of the commentary for various reasons (it doesn’t appear in contemporary Chinese records and the Japanese recensions might have been tampered with). The area of the text I’ve studied in detail (the section on hemerology) nevertheless appears to be appropriate to the 720s before later developments, especially by Amoghavajra. Also most Japanese scholars seem to agree the commentary is legitimately that of Śubhakarasiṃha and Yixing, though a modified version exists with actual siddhaṃ cited in the text in contrast to the earlier version which just transliterates everything into Chinese characters. There was also curiously in Japan at one point in the Heian period a text which appears to have been notes in Sanskrit on the sūtra or notes about the original Sanskrit version of the sūtra (梵本毗盧遮那成佛經抄記). It isn’t extant so far as I know, but it might have been the original notes taken from Śubhakarasiṃha’s lectures on the text which were collated and translated into Chinese for the commentary. As the story goes, he gave oral instructions (perhaps in Sanskrit) and Yixing put it all together as the commentary. Like other Indian monks, he might not have been so fluent in Chinese, especially since he arrived in China later in life. They had bilingual people at court though so this was less of an issue. There were basically Chinese families of earlier Indian descent which were responsible for translating Sanskrit astronomical and mathematical texts, so the language barrier wasn’t so much an issue at that point. The commentary mentions the seven-day week and twelve zodiac signs without going into details about it, so this suggests to me such concepts from Hellenistic astrology had already gained a degree of normalcy around Magadha and perhaps the author of the sūtra likewise had them in mind. A date of around 640 seems accurate to me. I don’t seem to recall Yijing several decades later mentioning anything of the sort though, which maybe suggests the lineage initially was small and secretive. It is a real mystery what was going on at that point. Nalanda might have been the affiliation that monks carried with them. I imagine the name carried a lot of weight and it was known far and wide, even in China. It might have been equivalent to how we might identify with Oxford or Harvard. There were definitely many other monasteries, but I get the impression Nalanda was as much a brand name as it as a physical place and institution. Just look at how that name was preserved in Tibetan Buddhism. They also use it as a means of elevating Tibetan Buddhism as a whole above the others: they often claim to have the complete and perfectly preserved transmission of ‘Nalanda Buddhism’, which we’re told was the pinnacle of Indian Buddhism. I don’t see many Tibetan Buddhists challenge this narrative, but then I guess it feels good to think you’re the only one with the ‘complete transmission’ whereas everyone else is practicing deficient Buddhism. Yijing’s travelogue is worth reading. It is part of the BDK translation series. He actually gives a period witness account of the Buddhist scene in India when he visited in the latter half of the seventh century. He stayed at Nalanda for several years too, but he also mentions famous teachers and institutions around India. Nalanda was maybe the top place to study in eastern India, but down south and in the west there were also notable teachers and institutions, though maybe their names never made it down to us today for the most part. That also brings to mind an interesting point: how much of our understanding of Indian Buddhism is derived largely from what we inherited also through Chinese and Tibetan traditions, which in the later period often reflect only Magadha Buddhism?